Paris Match is a weekly French magazine which covers news, entertainment, fashion, and celebrity lifestyle features. It was founded in 1949 and is one of France's most successful and influential magazines. It was often compared to America's 'Life' magazine, partly due to the emphasis both magazines placed on high quality photojournalism. 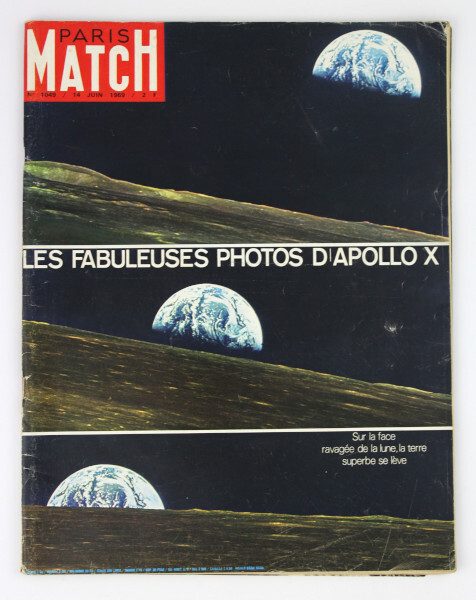 This issue features photographs from Apollo 10 on the front cover. Apollo 10 was the second crewed mission to orbit the Moon and was a "dress rehearsal" for the first Moon landing. The magazine was published the month before the Apollo 11 crew landed on the Moon on 20 July 1969. It shows the international interest in the Apollo missions at the time.